I’ve been wanting to write a post since the second day into this challenge! But life is busy, right? I have had so many lovely moments in each of the past seven days, each so different from the one before. Some days I’ve been full of energy and excited to spend an hour or more on my yoga mat, some days I’ve been so full and tired and felt relieved to be able to squeeze in my ten minutes right before I collapsed into bed. And I’m almost shocked to say that I’ve actually done some amount of yoga EVERY SINGLE DAY so far. I’m super proud of myself for keeping up with this commitment. And thankful for all the ladies participating in this challenge, and keeping us all motivated with their supportive, kind, honest, and funny words. 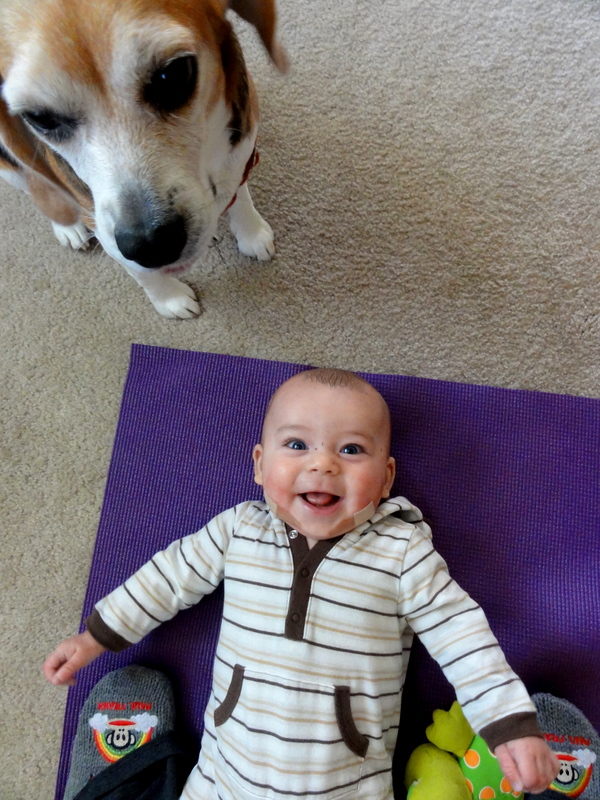 The first few yoga sessions, I was reluctant to give up my time during Mason’s naps… so we did yoga together. I had recently gotten a mommy & me yoga dvd through a book swap website that I LOVE, and had only tried it once before. He would got tired halfway through the first time and needed to go down for a nap… but while he lasted, he seemed to love it, which was so fun. He would watch my arms go up and down and side to side during stretches, he loved being right under me and I coo’ed at him during a swan dive, and he sat or stood on my belly while I did bridge pose. Mark even joined in once we hit the weekend, and it was family yoga! I was in heaven! There were grunts and giggles, pauses for diaper changes and a lovely shavasana at the end with a quietly kicking babe lying between us. Mark even found a couple netflix yoga videos and did them on his own on the weekend days I worked. I was thrilled that this challenge was catching on in our home! One of my most inventive yoga sessions was this past Friday. The morning flew by, I worked the afternoon away, and then Mark and I drove down to a Ryan Adams concert (ps… AMAZING) in LA, getting back home around 1am. I realized on the way to work, that there was no way I was going to want to do anything besides fall into bed when we got home from the concert, but I was on such a roll, I didn’t want to miss a day! You know, I’ve been doing massage for about four years now, and while I do feel I am “present” for every massage that I do, I have to be honest in that I’m definitely not present for every moment in each massage. After doing thousands of massages… it’s almost like driving home… some of it happens on auto pilot. But I tried to stay very aware throughout the entire first massage and an hour into the second (before I had to take it down a notch and just focus on the massage because I felt like I had been in a two hour yoga class!). I tuned into my client’s bodies, and the changes in their muscle tissue as I worked on them. I tuned into my own body, and how I held it, my alignment, and how I was leveraging my balance and shifting my weight to apply the necessary pressure. And I was even able to throw in a few yoga poses as I massaged. Which felt amazing to me, and seemed to bring more of a centeredness to the work. I warrior’d my way down my client’s back. I stood in tree pose while working on their neck. I took dancer pose as I ran my knuckles up their leg. It took concentration, but I feel like it made the massage better for both of us. I even did a quick sun salutation while their feet rested in warm towels. Yoga while doing massage… who knew! Here are a couple yoga videos that I’ve found on youtube over the past week… And again, if anyone wants to play along, do click the banner at the beginning of this post and link up! This challenge. It’s amazing. I can’t believe you can do yoga while giving a massage! So cool!! Love you! so glad you are with us, and i love reading your journey!!! thank you for sharing.